Calling all carnivores! This is our meat lover’s pizza! This pizza includes the “full house” of meaty pizza toppings. Our signature Full House pizza is layered first with marinara sauce and stringy delicious mozzarella cheese. Then comes the first layer of meats. Pepperoni, and ham. Next delicious Italian sausage & ground beef is dropped on top of the pepperoni-ham base layer. Lastly, the Full House is topped with yet another layer of that oh-so delicious mozzarella cheese. 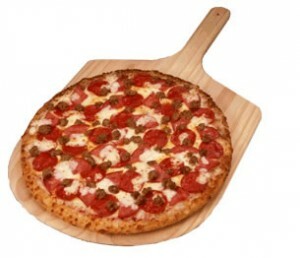 Baked to perfection with a crisp, golden-brown crust and delivered hot and fresh to your door.